A toxicity charge, also known as the t-charge, came into effect in London yesterday (October 23) which will see vehicles that exceed minimum exhaust emissions required to pay a daily surcharge. This was covered extensively by national media including the BBC, Independent, and Sky News, with the Daily Mail also leading on the impact of domestic wood burning on air quality. This came on the same day as a Freedom of Information response revealed the cost to the government of fighting action brought by Client Earth against its NO2 air quality plan. This was picked up by The Guardian. We are working with towns and cities to clean up emissions hotspots, but are clear that local leaders are best placed to develop innovative plans that rapidly meet the needs of their communities. We have put in place a £3 billion plan to improve air quality and reduce harmful emissions and we will end the sale of new diesel and petrol cars by 2040. Next year we will publish a comprehensive Clean Air Strategy which will set out further steps to tackle air pollution. On Monday, the UK’s Chief Veterinary Officer urged farmers to remain vigilant for signs of bluetongue virus. The call came after the disease was successfully picked up by the Animal and Plant Health Agency (APHA) in a number of cattle imported from France through our robust post-import testing regime. Action is being taken to ensure there is no spread of the disease, with movement restrictions at the affected premises, targeted surveillance and the humane culling of animals where necessary. The news was covered by a range of local and trade media, including BBC Scotland, the Yorkshire Post, Farming UK. The UK remains officially bluetongue-free and exports are not affected. Bluetongue virus is transmitted by midges and affects cows, goats, sheep and other camelids such as llamas. It can reduce milk yield, cause sickness, reduce reproductive performance or, in the most severe cases, cause death of infected animals. The UK Government will continue to work closely with a number of groups to raise awareness of the threat of bluetongue through the Joint campaign Against Bluetongue (JAB). Bluetongue does not pose a threat to human health or food safety, but can cause severe disease in some cases or have a negative impact on farm incomes, for example by causing reduced milk yield in cows and infertility in sheep. 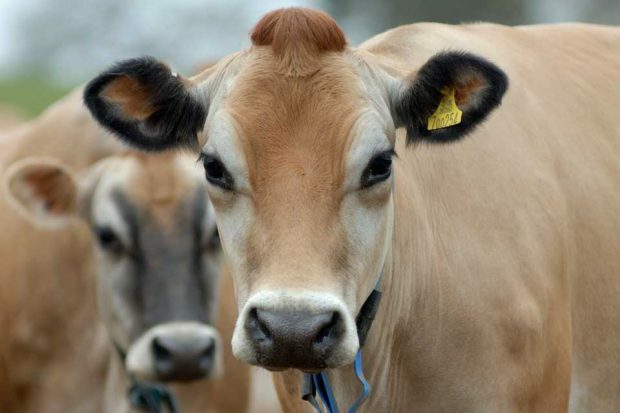 We continue to carefully monitor the situation in France, where Bluetongue disease control measures are in place. This detection is a good example of robust disease surveillance procedures in action and should highlight to farmers the risks which come with bringing animals from disease-affected areas into their herds. It is also a timely reminder for farmers that the disease is still a threat, despite coming towards the end of the period when midges are most active. Keepers must remain vigilant and report any suspicions to APHA. They may also want to talk to their vet to consider if vaccination would benefit their business. BBC Breakfast ran a piece on illegal ivory trading this morning, following the UK Government’s announcement we will ban ivory sales to protect elephants. A record 40 tonnes of illegal ivory was seized around the world last year amid reports there has been an increase in the amount of ivory being carved into bangles in Africa rather than being exported to Asia as tusks, which are easier to intercept. CITES Secretary General John Scanlon said global efforts to stop ivory poaching is starting to have positive results but there is more work to be done. Our ban on ivory sales will combat poaching and remove opportunities for criminals to trade illegally poached ivory. The proposals for a ban will stop the sale of all ivory produced at any date, with minimal exemptions, for example for pieces of historical significance. The decline in the elephant population fuelled by poaching for ivory shames our generation. The need for radical and robust action to protect one of the world's most iconic and treasured species is beyond dispute. Ivory should never be seen as a commodity for financial gain or a status symbol – so we want to ban its sale. 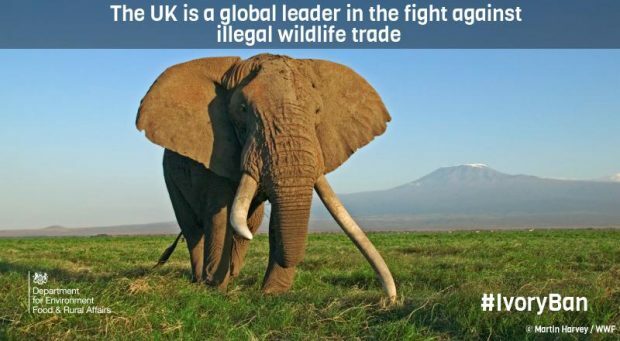 These plans will put the UK front and centre of global efforts to end the insidious trade in ivory.